Inshore- The red tide is now around Johns Pass but hasn’t scared off or killed everything. We still have large schools of bait fish from glass minnows to decent sized green backs from the sea buoy all the way through the pass. These bait schools often have mackerel, ladyfish and even Jack crevalle around them too with plenty of seabirds diving them. However, we do have some dead fish around the pass especially due to the stronger new moon tides we had this past weekend. Luckily the city and the county are very on top of the clean up and the smell isn’t bad and most of the time hardly noticeable. Also, the red tide is not nearly as bad as it was for the southern west coast of Florida we are not experiencing the coughing, gagging and burning eyes that will happen when the red tide is super thick and concentrated at the moment which is quite the blessing. Also, we are still seeing snook around the docks especially in the early morning hours around sunrise hanging around the tide poles and pilings. Most of the dead fish are smaller pinfish, pigfish, eels and croakers but we are seeing some catfish, a few trout and the occasional mullet floating by too. We are hoping we get one of these tropical systems to come by and not cause any harm, damage, or flooding but enough to blow out this red tide and fish kill and break it up in the gulf. The sheepshead are still around the pass too often spotting a handful around the dock as we load and unload the boats. Offshore – The 12-hour extreme this past week did super well on the big scamp with over a dozen caught! We did have to battle some strong current, but we were able to catch fish through it and it slowed down through the trip allowing some nice amberjack on the vertical jigs. 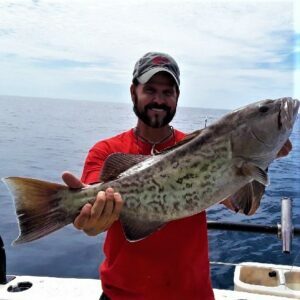 The red grouper cooperated for us too, and we got some nice ones on some big squid strips as well. Plus, we also got some big porgies, yellowtail and vermillion while out there fishing too. The water was super clean offshore, and we were completely past all the dirty water and fish kills that are mainly 20-25 miles from shore or less. 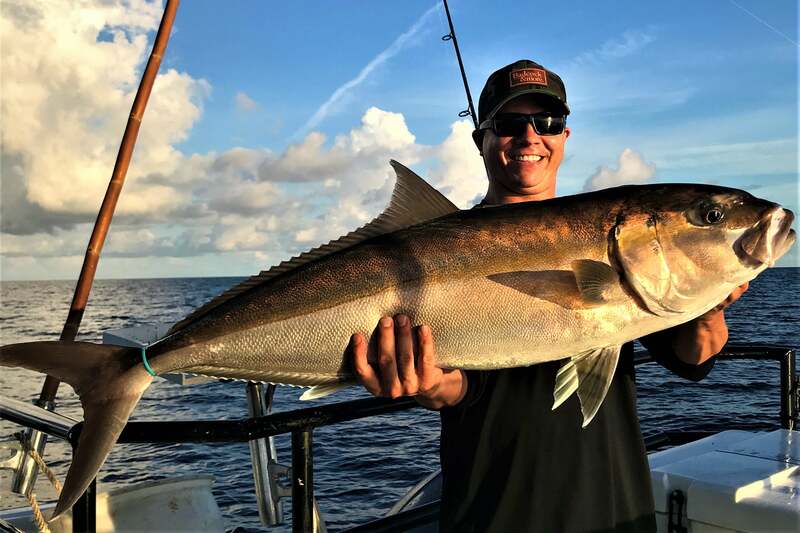 If you are looking to go deep check out the 12 hour extreme trip aboard the Flying HUB 2 right now the boat has SUPER light loads due to a slower time of year and the misconception that red tide is out here killing all the fish while the reality is that its very mild in our area compared to past year’s red tide events and its mainly right on shore. The red tide is finally starting to show up around Johns Pass unfortunately but thankfully its fairly minor and seems to change from day to day. We have only a few dead fish around, some days more than others, but the city and county are really staying on top of the clean up and preventing the build up that will cause foul smells around the area. Plus, there’s no serious coughing and gagging and burning eye side effects like you will get when the red tide is super bad. Were very lucky right now it’s fairly minor, but definitely around. However, we are still doing our tours and still finding plenty of playful dolphins and seabirds hanging around the area. The shelling lately has been phenomenal around shell key and our three-hour shelling trip Monday, Wednesday and Friday from 9am until noon is a great way to spend an hour on the island hunting for tons of great local shells. Plus, you have an hour ride down to the island through the beautiful intercoastal waterways and then you have a relaxing hour ride back from the island along our gorgeous gulf beaches. What a great way to spend the morning with your family, friends or whoever you want to show off our gorgeous local islands too and share some awesome shelling opportunities with. For more information on the fun filled three-hour shelling adventure with us at Hubbard’s Marina check out this page – https://hubbardsmarina.com/florida-shelling-cruise/Baby face our local famous dolphin that was hit by a boat’s propeller has made a miraculous recovery and just recently had a baby of its own! This is great to see this dolphin doing so well after such a traumatic injury and her and her newborn are doing well and can be spotted easily aboard our dolphin watching nature cruise and eco tour or the Madeira beach water taxi service! Despite the spotty dead fish areas and very mild red tide around the area, we are still able to spend the day at the island or along the islands. Plus, we are still able to snorkel most days around Egmont key thanks to that area getting plenty of fresh water pushed around with no thick areas of dead fish around the island. There’s some times see more than other days, so it’s more of a wait and see experience when it comes to our ability to snorkel or not but the island shelling is still going very well and the island is a great time right now since the crowds are gone and the island is free of people going to take the shells before you can get out there. Dry dock is in full swing, the Florida fisherman 2 is out of the water on the rails in Tarpon springs where our captains and crew will be hard at work making It even better for future guests. This will be around 5-6 weeks and were expecting to have it back in operation around October 16th just in time for that weekend’s long-range fishing adventures! 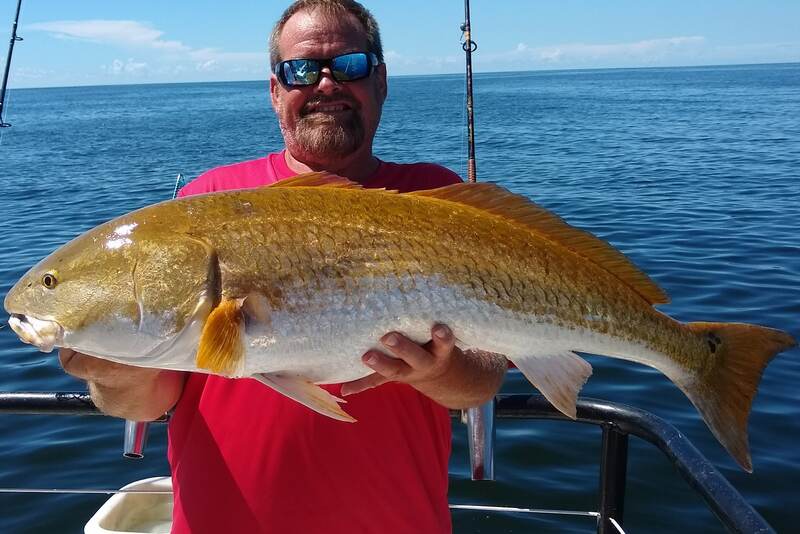 Red tide is NOT affecting our fishing near shore! 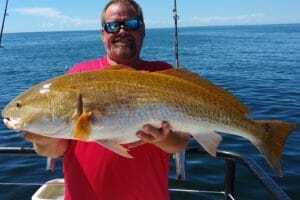 We are still catching plenty of great eating non-affected fish around Hubbard’s marina! Come join us for some ‘reel’ fishing fun during September and enjoy the SUPER LIGHT LOADS on most of our trips like the 12-hour extreme is often only taking 8-9 people offshore, the 12 hour night trips only have 18-24 people and the ten hour trips aboard the HUB only allow up to 14 people! The dolphin trips are super light, the island trips are nearly vacant, our beach cabanas are wide open and MORE! Come visit the beautiful gulf beaches uninterrupted by other guests or large crowds. We will NOT have any 39-hour trips during dry dock, so the next long-range party boat trip isn’t until after mid-October. However, the 12-hour extreme trip will get you to the 39 and 44-hour areas and have you back in time for dinner! Plus, the 12-hour night snapper trip is a great option to go out and target mangrove snapper Friday nights!